The Central Bank’s money and banking statistics have indicated that there has been an overall drop of €514 million, following a fall of €88 million in September. 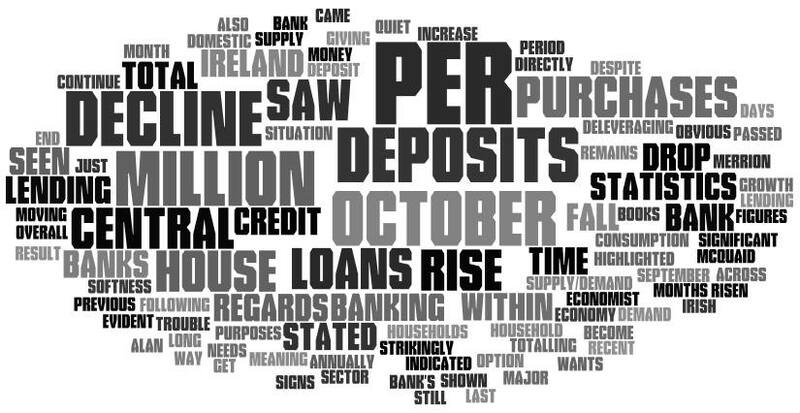 The Central Bank has stated that the situation as seen in October is a result of a €331 million decline on loans for consumption and other purposes, during which loans for house purchases also saw a fall by a total of €184 million. The figures highlighted a 1.9 per cent drop annually for house purchases in October. At the same time, there has been a decline in lending for house purchases – totalling a significant 8.6 per cent across the same period of time. While the decline in loans has become strikingly obvious, the banks’ deposit books are on the rise. By the last days of October, deposits had risen by a total of 2.8 per cent, which came directly after a 1.8 per cent rise at the end of the previous month. Household deposits saw an increase of 0.4 per cent, while corporate deposits saw a rise of 7.4 per cent. While banks within Ireland are deleveraging, lending will not be an option – meaning that the supply/demand credit will continue to be quiet. Article by LoansIreland.ie. Find news and information on loans, mortgages and debt in Ireland.